Hi Everyone! Hope you had a great weekend. We had a lovely one with no swim meets. And the swim season is winding down. They're tapering, which means no more weekday 6:00 am practices. Yay! Before I get to my fantastic interview today, I have a few winners to announce. Yay! The winner of THE TORN WING is RYAN SNYDER! And the winner of ASHEN WINTER is GWEN GARDNER! Today I’m excited to interview debut author Shelby Bach about her new book OF GIANTS AND ICE that was released on July 24, 2012. I really enjoyed the world Shelby created around the Ever After School, an after school program that involves fairy tales. And I could really sympathize with Rory’s desire to be appreciated for herself and not because of her famous actress mom and her director dad. When Rory realizes fairy tales are the real deal at Ever After School, she embarks on a classic quest to fulfill her destiny.Rory Landon has spent her whole life being known as the daughter of a famous movie star mom and director dad. So when she begins a new after-school program and no one knows who her family is, Rory realizes something is different. And after she ends up fighting a fire-breathing dragon on her first day, she realizes the situation is more unusual than she could have imagined. It turns out the only fame that matters at Ever After School is the kind of fame earned from stories Rory thought were fictional. But as Rory soon learns, fairy tales are very real—and she is destined to star in one of her own. Hi Shelby. Thanks so much for joining us. After college, I worked in children's publishing for about a year, and when I decided to leave New York, I also decided that I was going to write a new book, start querying, and really try to get published. I was just really lucky it all worked out. 2. I bet being in the publishing industry helped you a bit in the process. How did you come up with the idea for your story and the Ever After School? Weirdly enough, I was thinking about Disneyworld one day. I thought that when I was a kid, I didn't really want to meet a fairy tale character as much as I wanted to be a fairy tale character. Then, I started wondering where kids who would grow up to fairy tale characters might hang out, and that's when the phrase “Ever After School” popped into my head. It wasn't long before I knew that EAS met every afternoon, that their required reading was fairy tales, and that all their teachers were grown-up Characters themselves, and I couldn’t wait to write about kids trying to balance two worlds: one where they might be asked to fight dragons on their first day, and one where their parents expected them to finish their math homework after dinner. 3. I love hearing how people come up with ideas for their books and seeing the one idea that got them going. Getting the voice right is so important in middle grade stories and you did a really good job of this with Rory. Share some of your tips on nailing the middle grade voice. That's really kind of you to say - thanks so much! The best advice I can give to an adult writer is to try and remember how you were when you were a kid. That was really hard for me – when I started The Ever Afters, I had to take a break during the early chapters to re-immerse myself in eleven-year-old Shelby. I reread all my favorite books from that age, dug up old pictures, listened the music I loved back then... I even re-visited my old middle school one weekend. This is what I remembered: kids are full of feelings, and unlike adults, they may be feeling certain emotions for the first time - they have nothing to compare it to, so they can’t calm themselves down by saying, Hey, this is just like that other time, and this will work out too. Kids just have to brave and soldier on. Also, kids are mostly concerned with kids. They have their own friendships and power struggles and hierarchies completely separate from grown-ups. Sometimes, adults just register like the wah-wah-wah voices in the old Peanuts cartoons. 4. Great advice. So true kids are concerned about their world of kids, not adults. Rory has an interesting relationship with Chase. What were some of the challenges in developing the arc of their relationship? The biggest challenge was being stuck in Rory's POV and still making it believable that Chase could be both a huge bully one day and a loyal friend later on. Chase knew from Day 1 that Rory was going to be cool, and he wanted to befriend her as quickly as possible. All Rory saw was a big show-off who acted like he should be in charge. Although he doesn’t think playing a practical joke on her is a big deal, she takes it the wrong way. Rory takes a lot of things the wrong way, even when Chase - completely in earnest - tried to offer his help in sword class. Between her attitude and Chase’s jealousy, their relationship deteriorated from lots of misunderstandings to open hostility. Then I had to walk a fine line - making them mean to each other but not unforgivable. 5. I think you did a good job showing the natural progression. And I think kids will be able to relate to it. Are you a plotter or a pantser and why does that work for you as a writer? Plotter. I always have an inkling of where a scene or a storyline will go. I think it works for me, because I'm okay with surprises – sometimes, my plan doesn't work, and when another idea presents itself while I'm in the writing "zone" or when I'm revising, I switch gears. Some of my favorite parts come to me this way. 6. I have to know where my story is going too. 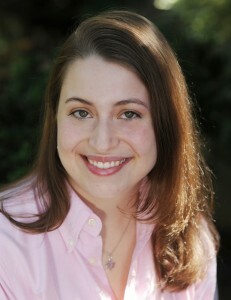 Joanna Volpe is your agent. I’d love to have her as an agent too. Tell us how she became your agent and about your road to finding your publisher. Oooo, Jo is the best. Let's see - this was way back in February 2010 when Jo was aggressively building her list. I was doing some research, and I kept seeing interviews from this awesome, passionate young agent named Joanna Stampfel-Volpe. I queried her while I was living in Montana – I didn't hear back for a while, assumed she wasn't interested. Then, one day, I decided to get some exercise, left the cabin, and went skiing for a little while. Halfway up the ski lift, I heard my Blackberry ping with an email: Jo was eager to see the full manuscript. So, I cut my skiing day short and hurried back to the cabin to email it to her immediately. 7. I'd love to have an experience like that. OF GIANTS AND ICE was released about three months ago. In retrospect, what worked well in your marketing efforts around its release? What would you do differently? I highly recommend visiting schools. From a research perspective, it’s fantastic to meet directly with your audience, and it’s also awesome to see them get so revved up about reading and writing and meeting a real live author. I love to give a presentation and then hear a bunch of sixth graders tell me that they’re going to go home and write their own novels now. The major thing I would do differently is the design of marketing materials. I made the decision to do it all myself - the bookmarks, the chapter samplers, my website, the stickers, invitations, etc. But when I started working on these things, I had zero Photoshopping experience. Although all of those materials turned out reasonably well, I think it would have been better either to hire someone else to do them or to take a class. It’s already stressful enough being a new author – you don’t need to feel anxious about not knowing what you’re doing. 8. I'm definitely going to follow your advice to get some help. What advice do you have for aspiring authors? a) Practice makes perfect. I wrote seven novels before I tried to get published, and I can't tell you how valuable the experience was. I don't know if I could have finished Of Giants and Ice if I didn't already know that I could write a whole book. b) Believe in the story you're writing. I knew from the beginning that Of Giants and Ice was different than everything I'd written before. For the first time, it didn't just feel like a book I wanted to write. - It felt like a book an eleven-year-old Shelby would have needed to read. Shelby's agent generously offered a copy of OF GIANTS AND ICE for a giveaway. To enter, all you need to do is be a follower (just click the follow button if you’re not a follower) and leave a comment by midnight on November 3rd. I’ll announce the winner on November 5th. If your e-mail is not on Blogger, please list it in your comment. And don't forget to enter my contests for CREWEL, a fantastic YA dystopian/sci-fi story, THE RAVEN BOYS by Maggie Stiefvater, and SAMANTHA SUTTON AND THE LABYRINTH OF LIES, a great sounding story about an Indiana Jones-like middle grader on an archeological trip to an ancient Peruvian temple. The links are at the top of the blog. On Wednesday, I'm excited to interview debut author Laura Ellen and give away an ARC and book of BLIND SPOT, a fantastic contemporary YA book about a girl who's dealing with macular degeneration, a schoolmates death, and a whole lot more. I'm going to her launch party tomorrow night and will get the ARC signed for you and buy a copy of her book that I'll get signed for you. I can't wait! Next Monday I am SO thrilled to share an interview with New York Times best selling author Cinda Williams Chima and give away a copy of THE CRIMSON CROWN, book 4 in The Seven Realms series. This is a fantastic fantasy series as good as George Martin's A GAME OF THRONES. Even if you haven't read the other books in Cinda's series, you'll want this book and you'll want to read Cinda's awesome advice. She's an amazing writer that I was lucky enough to meet at a SCBWI conference. I love the premise of the Ever After school! Thanks for the interview. It was so interesting to hear about the process behind the book -- and inspiring to hear about your success after many "practice novels". Very cool premise and what great titles!! I definitely agree with your advice--thanks!! What a great idea for a series! And I love that she's kept her writing notebooks from when she was a kid -- school audiences will love seeing those. Best wishes to Shelby, and congratulations to Natalie on another great blog entry. I love the premise, too! Another great book for me and my daughter. Thanks Natalie and Shelby! This sounds like a really great book, and one I haven't heard of too. Thanks for posting the interview. The premise sounds so intriguing! Thanks for word about it and offering a giveaway. Sounds like a fun book. I love Middle Grade books. Wonderful interview and great concept for a series. I hope I win! Thanks for both the interview and the giveaway. 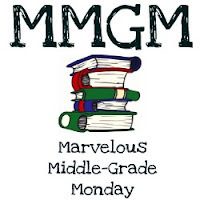 Middle grade sounds like so much fun to not only read, but write. Thanks for this interview. It's been an awesome read - yeah, I was lucky in getting my copy already - and I'm so thrilled about sharing it with my daughter...who happens to be enthralled with the book cover. Great interview Shelby and Natalie. And thanks for the soon-to-come interview mention. Yay! I won a copy of Ashen Winter! Thanks Natalie and Mike:) I can't wait to read it! 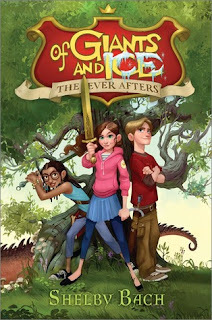 The Ever After series sounds so good. Congrats on your release, Shelby. Thanks for the interview mention, Natalie:) See you on Wednesday. This book sounds absolutely wonderful. I wish I could have read it when I was eleven! I can't wait to get my hands on this book! (And then my daughter can read it when I get done. :-)) Thanks for a great interview. I'm not sure if my e-mail is on the following post, so it is meganclements4 [AT] yahoo [dot] com. Thanks! It looks like a GREAT fun book. I recently read "The Hero's Guide to Saving Your Kingdom" and loved it and was hoping to find something in that fairytale realm. A great interview! Love the interview! This sounds like a fun book, and how cool that is started out with thinking about Disneyland! Thanks for hosting the giveaway! What a clever premise--good idea to visit schools! I'll definitely have to read this one! Congratulations to Shelby on her debut. And thanks for the advice about not trying to do all the marketing stuff yourself unless it's something you really know how to do. What a great giveaway! I would love to win this book because your interview made me very interested in this book. I love the cover and enjoyed learning about the author. I especially enjoyed her advice- believe in yourself. So true! This one is on my radar--thanks for the giveaway!